Recommended to: Readers who like stories with lots of character growth and life lessons. A humorous coming of age tale of friendship, sisterhood, and family drama set against the gorgeous backdrop of northern Italy. Italy, the late 80s. Leda is a bookish tomboy whose life is turned upside down by shady Nico, who just moved north from Sicily. Their unlikely friendship will evolve through a whirlwind of adventures leaving both kids transformed. Ultimately, Leda will discover that adults aren't always right, marking the end of childhood and the beginning of everything else. Recommended for ages 13 and above. Some swearwords, mostly in Italian. The book is the first in a series following the same characters throughout their life. Ah, to be young again. When I first met Leda, the protagonist of An Italian Adventure, I instantly took a liking to her. Leda, or Lee as she prefers to be called, struggles with the age old problem that faces all tomboys at some point in their lives. The point where being "one of the guys" no longer holds the easy sway that it once did. That time in the life of a girl where boys become interesting in a different way, and all those feelings get mixed up in your brain. The time when, out of the blue, one of your friends starts to feel like more than just a friend. I went through this same thing when I was around Leda's age! And so, she and I became fast friends. The biggest draw to this story for me, besides Leda's character of course, was the setting. Italy in the late 80's came to life on these pages. I was smitten with the carefree way that children bounded off to go play with no prior plans. Climbing trees, racing bikes, getting up to all types of mischief that happened well away from the eyes of their parents. As someone who never experienced that, I was enchanted by their freedom. So much growth was allowed to happen. So many lessons learned. It was a great look into the way that our experiences shape us. I also very much liked the dynamic of Leda's family, since it was so realistic. Her mother and father weren't perfect. Viola, the older sister, made poor decisions at times and exhibited teenage emotions. In fact, every piece of Leda's family made sense to me. I liked that Gaia wasn't afraid to touch on the idea that families can be whole, and show love, without always being perfectly shiny on the outside. It was refreshing to see a family that had some flaws, and some cracks, and still held it together just the same. So why the three star rating? Honestly, the way An Italian Adventure is actually written was the culprit. I believe that the aim was to look at the world through the eyes of Leda, a day at a time. Almost as if she was penning it all down in a diary. The downside to this was that it felt very choppy. There wasn't a ton of narrative flow between one section of thoughts, and the next. Sometimes Leda's thoughts were just so jumbled that I had a hard time getting through them. That's not to say that wouldn't be entirely accurate. Still, it made it more difficult to fully immerse myself in the book. Overall, I'd say this is a solid read. 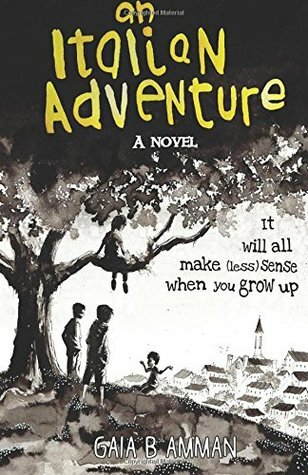 If you like stories that are full of growth and life lessons, with a smattering of humor, this is definitely for you.